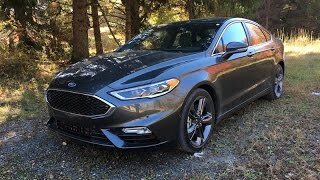 Ford has been rolling dices with its Fusion model since 2006 and now taking the same a lap ahead, they shared the Ford Fusion V6 Sport 2017 at the Detroit Auto Show 2016. The luxurious family sedan has lots of power and All-wheel-drive with some features that can undoubtedly rule your senses. 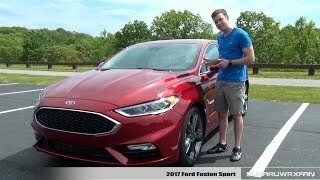 Let us get to know more about the model, through the review of Ford Fusion V6 Sport 2017 below. Though the interior of Ford Fusion V6 Sport 2017 is almost the same as its predecessors but the company has given a bit of ‘special touch’ to make it look sportive. Ford has added a configurable digital dashboard mounted with three-spoke thick-rimmed steering wheel. The shift dial on center console also features a new look while the massive touchscreen comes with SYNC system to enhance your experience. Talking about the space, center console comes with larger storage bins and has sufficient space to house your phones and other devices. Talking about features, it has the all new and first of its kind pedestrian detection system, perpendicular parking and Blind Spot Information System. 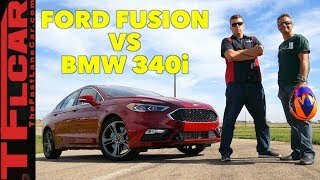 Thus rounding up the interior details of Ford Fusion V6 Sport 2017 all I would say is, it is an impeccable amalgamation of tech, comfort and luxury. The exterior of Ford Fusion V6 Sport 2017 doesn’t have enough changes. The primary change includes the addition of LED accents over headlights and the front fascia. The inclusion makes the model look classier. Keeping almost everything like the rest in the lineup, another feature that makes this model look distinct is the massive rollers designed attractively. The 19-inch wheels feature gloss black mesh grille while at the rear end there a spoiler mounted over the deck to enhance the sportive look. Thus rounding up the exterior details of Ford Fusion V6 Sport 2017 all I can say is, it’s sporty and classy. Beneath the hood of Ford Fusion V6 Sport 2017 is the powerful twin-turbocharged EcoBoost 2.7 liter V6 engine generating total output of 325 hp and peak torque of 475 nm. 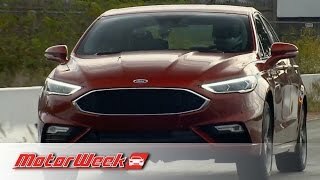 The performance figures of Ford Fusion V6 Sport 2017 are still not shared but we assure to present them as soon as company announces the details or we get the chance to test ride this luxurious family sedan.